Let’s start with the awesome, shall we? My mother found a coin necklace passed down through my family! She found it while cleaning out some old drawers, and the second she handed it to me I was in heaven. Apparently it belonged to my great grandma, and possibly even previous descendants before her! 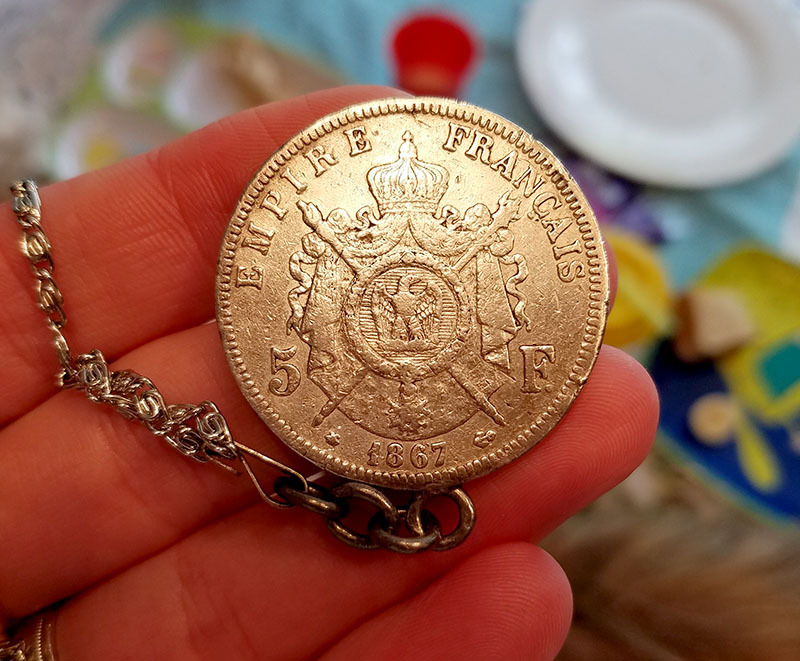 It’s a French 5 Francs from 1867, and has a decent chunk of silver in it too comprising of 0.723 ounces. 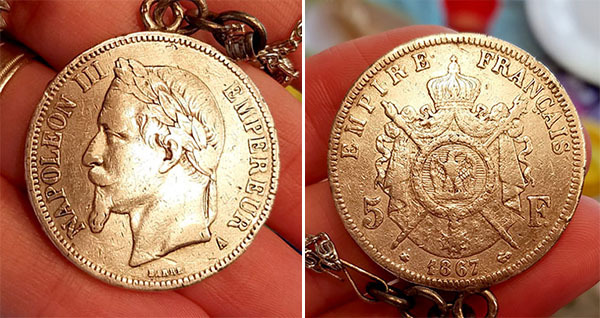 The obverse shows NAPOLEON III EMPEREUR along with a pretty mug of his, and the reverse – EMPIRE FRANCAIS – 1867 with “crowned and mantled arms” in the center. It’s a large and heavy one too! 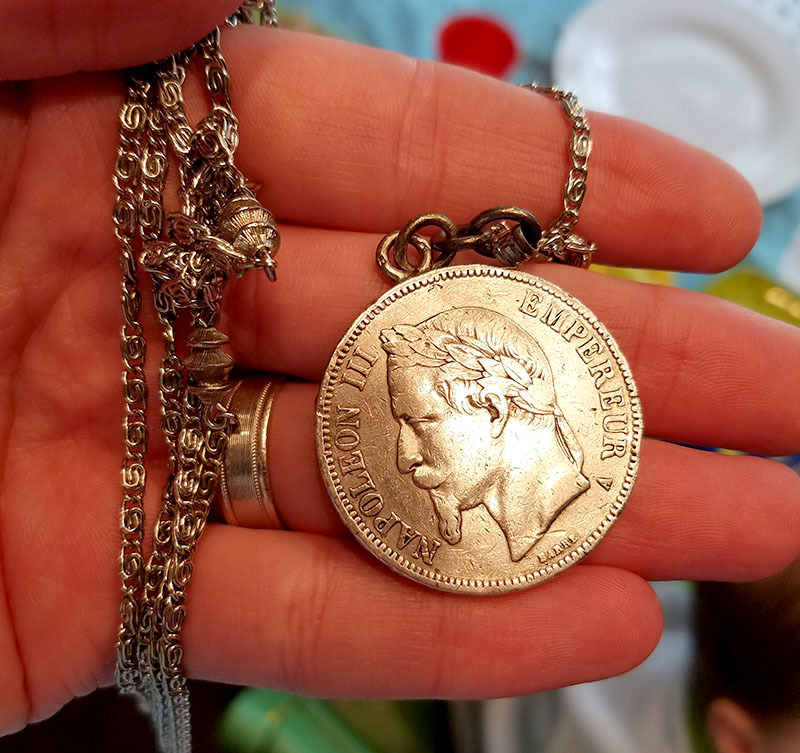 Probably only worth a little more than silver melt in its condition (though the chain could be worth something? ), but the sentimental value is sky high. It’s been heavily cleaned to make it “pretty again” according to my mom (NO MOM!!! NEVER AGAIN! ), and just an overall incredible thing to hold in your hands. Who knows how many of my ancestors have held it? It’s 150 years old! So this was the GOOD surprise :) The bad one? Yup, that’s right, what was once giveth has since been taketh away. Ugh…. I happened to leave it on my mom’s kitchen counter before heading home that night, and when I called to ask her to please hold it for me somewhere safe, she asked me where it was. So let this be a lesson to everyone to KEEP YOUR TREASURES SAFE! Don’t be careless like me leaving your gems scattered around! Thank goodness I snapped pics so it’ll live on! And not like we can bring this stuff with us when we’re gone anyways, right? Or is there some sort of Coin Clause up there above? Hi. You’ve mentioned the err of cleaning a coin twice in as many articles. With old money, the prettier it is, the more valuable. This is not the same with coins?? Thank you for your insights and entertainment! You are great! !